We awoke to 2 inches of snow on the ground and clinging to the trees on the mountain yesterday. But only a white haze was visible in the distance from “down below” when I went to the barn to ride this afternoon. 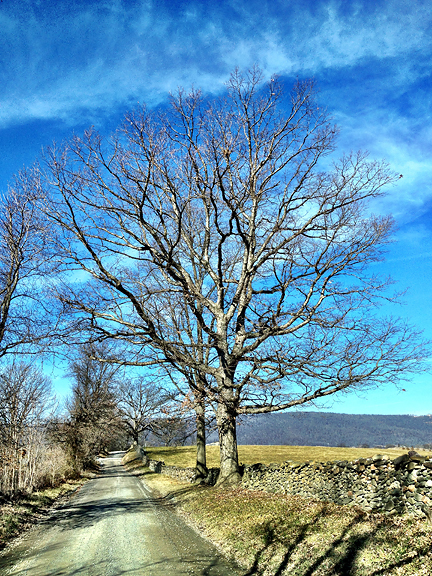 I paused on my drive home to photograph this tree, which was stunning against a vibrant blue sky. The hay field to the right of the stone wall is one of my favorite places to ride, and I look forward to taking Teddy out for hacks here when he has a bit more experience on the trails. By the time I returned to the mountain, the sun had melted most of the snow from the tree branches, leaving a thin white blanket on the ground on the spine of the Blue Ridge. The snow probably won’t melt for a few more days up here, so I’ll enjoy a taste of winter at home and the feeling of the upcoming spring down below. Great picture, you really do fine art/nature very well. Keep up the wonderful work! Thank you so much for your kind words! I appreciate your input! what an amazing sky! great shot! Thank you, Laura! It was a unique cloud pattern. Glad I was in the right place at the right time! You certainly live in a beautiful place!! !